As a team we were really looking forward to this event as it has been a couple of years since we had been able to hold a ghost hunt at this huge Fort. 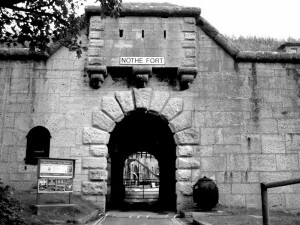 The problem was that the fort could never find staff who were willing to work at the unsociable time required for a ghost hunt. My first session we were joined by Toby a spirit from 1630s aged in his late 30s and Cecil, a Second World War soldier. Both spirits were able to manipulate people and move them in some way. During this time, we also heard some unexplained noises. The second group also felt the presence of Cecil and some movement was felt by some guests. The third group experienced lots of movement, most of it on command as well as strange horse related smells, many of which were not pleasant. The fourth group we were joined by a Second World War Captain who didn’t give his name, although he was stationed in Weymouth during the war. This spirit was able to move everyone with ease, whether they wanted to be moved or not. Many people in all groups felt hot and cold spots and heard strange noises, although this Fort is on a headland and some of these noises could have been caused by the wind, as the early part of the night was windy. It became still as the night progressed. This was an excellent ghost hunt with all groups experiencing paranormal activity but unfortunately the Fort Management have cancelled all future events from all ghost hunting groups and companies based on an uneducated, ill-informed and close-minded opinion of the world of ghost hunting. Probably acquired from something the committee members watched on television, which is made for entertainment purposes. Not the real world of ghost hunting.